Vice Minister Park Young-joon of the Ministry of Knowledge Economy in his speech at the New Year’s reception for the new and renewable energy industry held at the Inter-Continental Hotel in southern Seoul on Jan. 25 said the government would not spare any of its support to the industry so that it can do its best to export its products at this juncture when Korea is on the verge of becoming an energy exporting nation from an energy importing nation with renewable energy exports nearing $10 billion. He lauded the industry for displaying a new hope in such areas as exports, production, investment and employment with its ceaseless efforts last year despite difficult conditions and said he hoped the industry would do likewise this year, creating many quality jobs through preemptive and offensive investments. Key attendants of the event included Rep. Kim Young-hwan, chairman of the Knowledge Economy Committee of the National Assembly, and Chairman Chung Ji-taik of the Korea New and Renewable Energy Association, among others. The participants at the event said the industry broadened its horizon for its development and is attracting tremendous attention with the introduction of the renewable portfolio standards (RPS) in April, the announcement of the New and Renewable Energy Development Strategy in October, and the road map for a sea wind power plant construction plan last November. 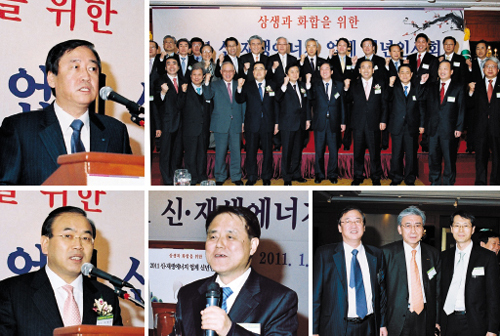 (photo from far left, counterclockwise) Chairman Chung Ji-taik of the Korea New and Renewable Energy Association(KNREA) speaks at the New Year’s reception for those in the new and renewable energy industry on Jan. 25 at Inter-Continental Hotel in southern Seoul;Vice Minister Park Young-june of the Ministry of Knowledge Economy (MKE) delivers a speech. ; Chairman Kim Ssang-su of KEPCO gives a speech. ; Chairman Lee Sang-chul of Millinet Solar poses for a photo session with KNREA Chairman Chung Ji-taik and Kang Nam-hoon, director general of energy policy at the MKE,; and the participants of the gathering make New Year’s resolutions at the reception.